A voltage signal transmitted from the engine oil pressure sensor is lower than 0.3 V.
A voltage signal transmitted from the engine oil pressure sensor is higher than 5.02 V.
NO >> Check engine oil leak. Refer to LU-6, "Engine Lubrication System Schematic". Is 1st trip DTC detected? YES >> Proceed to EC-340, "Diagnosis Procedure". Disconnect EOP sensor harness connector. Check the voltage between EOP sensor harness connector terminals. Check the continuity between EOP sensor harness connector and ECM harness connector. Check EOP sensor. Refer to EC-342, "Component Inspection (EOP Sensor)". NO >> Replace EOP sensor. Refer to EM-94, "Exploded View". Check the voltage between EOP sensor harness connector terminal and ground. 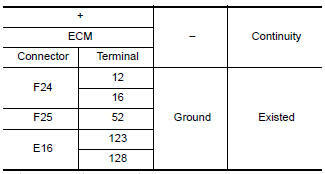 Check the continuity between ECM harness connector and ground. 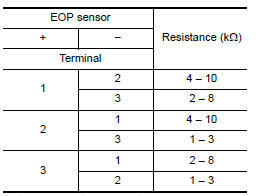 Check the resistance between EOP sensor connector terminals.